Hi chrisfromiowa, thank you for posting comments to my old article. Unfortunately I don't have a chance to play both HD-2 and PS-024 so I tried to surf user's review in the internet world. Then I could find some results. HD-2 Harmnic Distortion is the name of distortion but I realize this is similar with fuzz. There are some HD-2 video found in YouTube. Due to lack of tone control, in my case, I do not want to use HD-2. Some user put good review on this pedal so it is up to your case. If you would like to control tone then I prefer to use HD-3. In case of PS-024 (PS-040 has same circuit board with 4558 chip set instead) it has 5 band EQ so it would be usefule rather than HD-2. 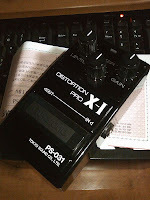 Either way, I can say the only suitable pedal of Guyatone are PS-1xx series. This series has high perfection and originality. 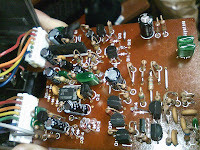 The other Guyatone pedals are something like a cheap, reprint version of some famous pedals (Muff, RAT, TS etc.). I think I will not satisfy with them. This is my thought and it depends on your use. I wish this reply will help for your choice.